—How Trump worked for thirty years to expand his real estate empire into Russia even as he was rescued from bankruptcy by Putin’s oligarchs and Kremlin agents. —How Russian intelligence gathered compromising material on him over multiple trips. —How Trump recruited Russian allies and business partners while running for president. —How he surrounded himself with advisers who engaged in clandestine negotiations with Russia. —How Trump aides and family members held secret meetings with foreign agents and lied about them. 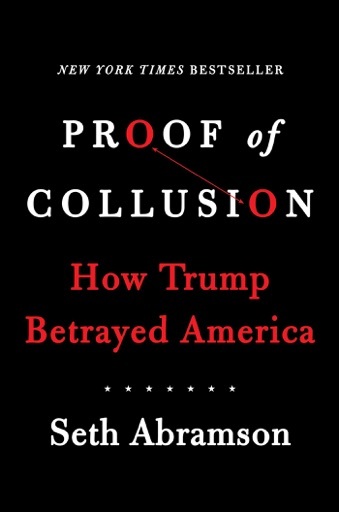 By pulling every last thread of this complicated story together, Abramson argues that—even in the absence of a Congressional investigation or a report from Special Counsel Mueller—the public record already indicates a quid pro quo between Trump and the Kremlin. The most extraordinary part of the case for collusion is that so much of it unfolded in plain sight. Not even Maddow is ahead of Abramson’s sober & even analysis. News headlines now seem like they are playing catch up. Note to MSM, hurry up!! The US populace needs this information NOW! Seth Abraham’s analysis of Trump dishonor, dishonesty and betray is brilliant. One one step in the removal of this cancer. This guy is out of his mind. There’s so much smoke in Proof of Collusion” I’m about to stop, drop, and roll. Proof of collision is meticulously reported and undeniably factual. This book is a must read. Seth’s in depth look at the proof of Russian interference and Donald Trump willing assistance is a must read.